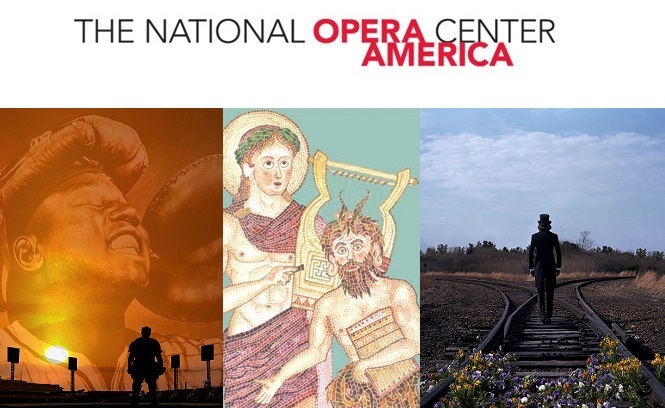 American Opera Projects is pleased to announce that several of its recent productions will be produced on stages around the country. Lera Auerbach’s The Blind, Tarik O’Regan and Tom Phillips’ Heart of Darkness, and Laura Kaminsky, Mark Campbell, and Kimberly Reed’s As One are each being performed in the coming months. Composer Lera Auerbach‘s The Blind will be presented by Central City Opera in their Summer 2015 Festival. The production was created and directed by John La Bouchardière and first produced by AOP in collaboration with Lincoln Center in 2013. This unusual a cappella opera for 12 singers is transformed into a unique theatrical experience by La Bouchardière’s unconventional production, which requires that the audience be blindfolded so that they must enter the world of the characters. “It’s not the characters who are blind,” said composer Lera Auerbach in a New York Times interview about the one-act opera, “The message is that we are the blind. With all our means of communication we see each other less and connect to each other less. We have less understanding and compassion for other people…” Adapted from an 1890 play by Maurice Maeterlinck, the story is about a dozen blind people who are taken by their priest on an outing. When the elderly priest suddenly dies, they are stranded on an island left helpless and scared. The group realizes that they never really knew the priest as a person as they stumble upon his cold, dead body. A Russian- American composer, Lera Auerbach wrote The Blind in 1994 while she was a student at Colorado’s Aspen Music Festival. 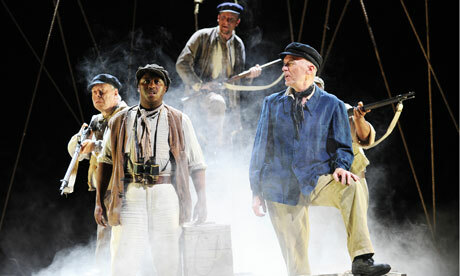 Royal Opera House Production of Heart of Darkness, London, 2011. Photo by Tristram Kenton. Composer Tarik O’Regan‘s Heart of Darkness will receive it’s U.S. premiere in San Francisco’s Z space by Opera Parallèle early May 2015. The opera was developed by AOP for several years, starting in 2006, and received it’s world premiere in London in collaboration with with Opera East, OperaGenesis and the Royal Opera House in the Linbury Studio Theater of the Royal Opera House in 2011. Adapted from the novella by Joseph Conrad by librettist Tom Phillips, Heart of Darkness is a powerful opera that portrays the greedy world of ivory smugglers in Central Africa as narrated by the central character, Marlow. In this new production, the plot unfolds through a series of short, fast-paced scenes that gradually increase in tension, as Marlow’s tale approaches its climax. O’Regan grew up in London, where he was born in 1978, spending some of his childhood in Morocco and Algeria. His music, recorded on over 25 albums and nominated for two GRAMMY’S®, is published exclusively by Novello & Co./G. Schirmer, Inc. Finally, AOP’s recent production of As One will tour to the Caine College of the Arts, part of Utah State University in Logan, Utah. After its September production and premiere at BAM, the critical response has been overwhelmingly positive with critics declaring it “a piece that haunts and challenges” (Opera News), “artistically distinguished, socially important” (WQXR), and “satisfying in an entertaining and delicately moving way” (NY Observer). In the chamber opera by composer Laura Kaminsky, librettist Mark Campbell and librettist/filmmaker Kimberly Reed, a mezzo-soprano and a baritone depict the experiences of its sole transgender protagonist, Hannah, as she endeavors to resolve the discord between her self and the outside world. The work featured performances by Sasha Cooke, Kelly Markgraf, and The Fry Street Quartet, stage direction by Ken Cazan, and music direction by Steven Osgood. When Heart of Darkness (developed by AOP) premièred at the Royal Opera House’s Linbury Studios in 2011 it met with great acclaim for its ‘music of startling beauty’ (The Observer) and ‘a magical and haunting sound-world’ (The Telegraph). Composer Tarik O’Regan has now developed Suite from Heart of Darkness for orchestra and narrator. Tom Phillips, the original librettist, has worked closely from Joseph Conrad’s novella to create the text. The London première of Suite from Heart of Darkness will be held at Cadogan Hall on Tuesday 23rd April at 7.30pm. The concert is part of the Royal Philharmonic Orchestra’s Resident Season, will be conducted by Nicholas Collon and narrated by Sam West. Seats can be reserved here. Go on Tarik’s website for more detail. The piece, which was shortlisted for this year’s British Composer Awards and voted by Time Out: London as one of the Best of the Year 2010: Classical Concerts in London, “explores the theme of sleep as a metaphor, with death, love, fear, ecstasy, isolation, dreaming and rest all providing textual ‘variations on the theme’, drawing on poems across the centuries by Keats, Shakespeare, Samuel Daniel and Hart Crane.” Attendees of the John Armitage Memorial (JAM) trust’s 10th anniversary concert last March got to experience this dream-like piece in person when they heard it via the BBC Singers (directed by Nicholas Cleobury), Onyx Brass and organist Stephen Disley. Clearly music critic Jonathan Lennie was entranced as well, since it was this concert that made his Top 5 listing for the Time Out: London review. “The Night’s Untruth” has also been jointly commissioned by JAM and the American choir Vocal Essense to give its US premiere under director Philip Brunelle during the 2010-11 season. Sleep well, fair readers. Tarik O’Regan certainly is.